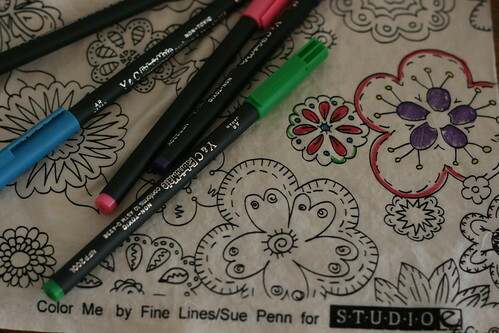 Studio E introduced a line of Color Me quilting weight cottons by Fine Lines/Sue Penn this year. They work in perfect combination with packs of textile markers from Fabric Mate (we carry two different color combo packs).These are non-toxic colorfast fine line marking pens made in Japan. 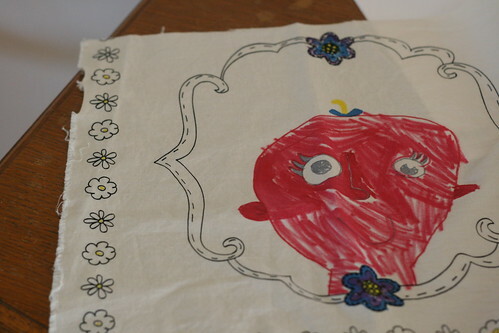 I think kids (and adults) love the idea of drawing and coloring on fabric, especially during these warm days of summer. Of course, any sort of black on light prints would work for coloring in, or you could skip the lines and just play with muslin or solid color cottons. 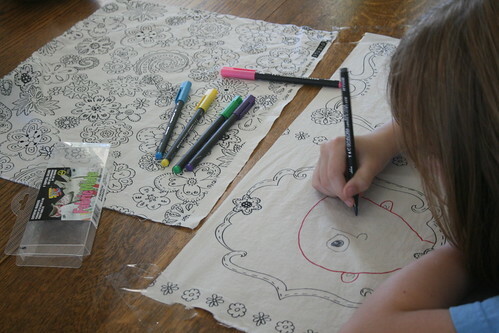 This is the sort of project that could save a whiny afternoon and make you a craft hero. But don't take my word for it! Our 9 year-old friend, Stella, was over and spent part of her afternoon trying them out.This girl is kind of a tough customer. M: What do you think? S: They are pretty good! They are definitely better than regular markers. The colors are bright. M: Are they easy to draw with? S: Yes. They are very easy to draw with. It takes a while to color big areas in though. M: Well, it is a lot of pink. S: Yes, it is a lot of pink. Finish the edges for lunchbox napkins or sew into a simple drawstring bag for dance or soccer shoes. Sew into a twirly skirt or kerchief. Buy several yards and use as a table cloth for your next dinner or birthday party! Have markers out for your guests and you'll have s memorable and long lasting keepsake. gina August 8, 2011 Books, Magazines + Reviews, Home Dec.